Pressure cleaning is the use of industrial cleaning machines and agents to tackle large-scale surfaces with high-intensity water cleaning. The method is often preferred for surfaces such as pavement and buildings, as it's able to readily clean large surfaces in very little time. Pressure cleaning tools are also able to reach heights that standard cleaners cannot, making them safer and more efficient. Pressure cleaning is ideal for roof structures and shingles as its power are able to combat debris commonly found on the roof. Any debris from animals, weather, or nature can easily be repelled from the roof surface without causing damage to the shingles or roofing structure. Power cleaners can extend easily, meaning they can reach across roofs with no issue and can even clean the chimney, if needed. Along with roof structure, pressure cleaning can also tackle the gutters, water spouts, and other attached outdoor materials that may also experience excessive debris buildup. 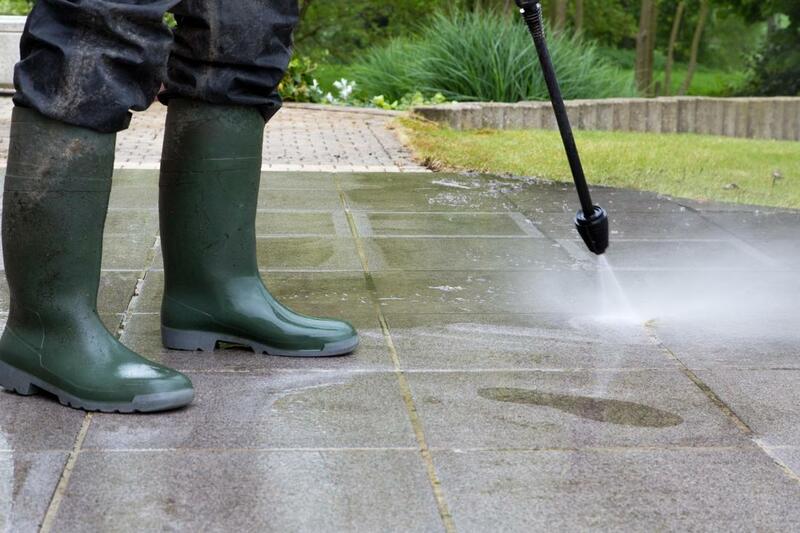 Pressure cleaning has proven to be the most effective way to clean patios made from concrete, bricks or pavers. If you’ve ever tried to sweep your patio to no avail or noticed that residue from the roof keeps falling onto it, it may be time for pressure cleaning. Even if you don’t notice the smaller twigs, leaves, and debris in your patio’s crevices, they can still build up over time and make the surface rigid and uncomfortable. Our patio pressure cleaning techniques can clean both large and smaller spaces, without the debris shifting indoors or ruining your backyard. Decks are often made wood, another dust-ridden material that can accumulate buildup over time. We pressure wash decks from top to bottom, including all the railings and stairs that are built into them. Our pressure washing techniques are tested to combat hard stains and outdoor elements that may otherwise linger or reoccur, such as bird droppings, sand, tree fallings. When we pressure wash your deck, not only do we remove all of the dirt, but it can also help your deck to appear brighter and newer than ever before. If you have a pool nearby, you can trust that the debris cleaned from your deck won’t subside into your pool. Pressure washing methods are often needed for homes and commercial businesses due to the extent of the cleaning needs. Building materials usually require only water solutions to keep them clean and bright, which can be achieved with pressure washing to drive away extra dirt. As some homes and businesses are taller than others, it's always best to enlist the help of professional cleaners to reach such heights and avoid personal injury. Pressure washing can reach extended heights, making it an ideal option for cleaning high surfaces such as home exteriors and high-rise buildings. We've been pressure cleaning homes and businesses in the area for many years, so you can trust our experience to deliver high-quality pressure cleaning safely to your home or business.